I can't believe it's the last week of October, the holiday season is right at our finger tips. So many fun things will be filling up our calendar starting with Trick or Treat this weekend! This past weekend was really busy, Ashlynn had a fair at her school that we stopped by at for a bit. They were doing crafts in all the classrooms and even had a bounce house outside. It was nice for her daddy to see her classroom and meet all her teachers. I think she was so confused why weren't leaving, ha. That afternoon we hit up playground and made some naan pizzas for dinner. Yesterday was grandparent day, Nany and Pop came over in the morning and Bopo came to visit in the afternoon and stayed for dinner. In between all that, we got a bunch of chores done and even put the new bedding on bed, finally coming together. 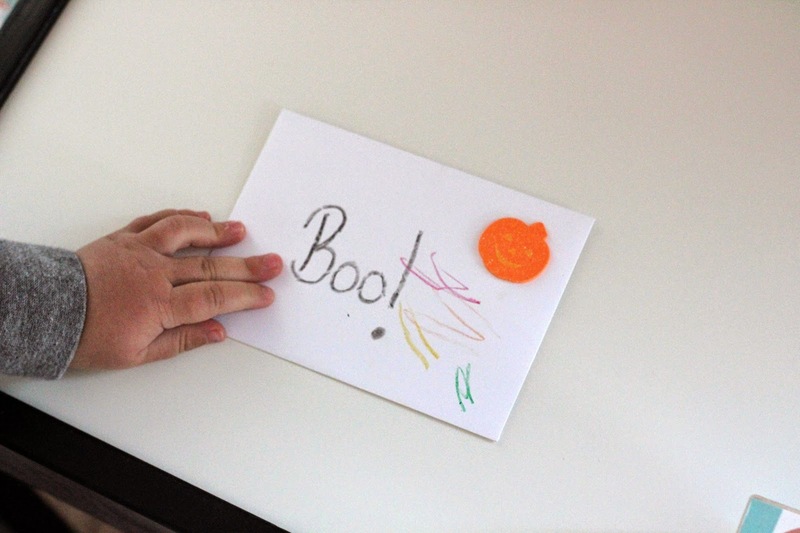 A few weeks ago we invited to participate in a blogger Halloween Swap. It was just a little goodie bag to send to another bloggie buddy (kids) to help celebrate the holiday. We were lucky enough to be paired up with Jess and Sadie from Sadie Sky Boutique. Jess clearly has momming of a two year old down, because she hit the nail on the head with her little gifts. Stickers and window clings, colored pencils, an awesome felt magnet craft project, a black cat sippy, a little tin to store them, and of course, some festive bows, her speciality! We loved the felt magnet craft, on a rainy day last week when Kenley took a late afternoon nap, we took it out and had so much fun. There were six magnets, two of each, so I could do one and she could try to follow my lead and instructions to make her own. The cat sippy is probably the biggest hit as she drink from it almost every day, and because of it, actually drinks water! This girl is a camel, or a horse, can lead her to water, but you know the rest. Thank you so much Jess and Sadie! We loved it! Check out Karra's blog, Just Us and Rae to see what we sent out! I hope everyone had a great weekend prepping for Halloween fun! that kitty sippy is so cute!! thanks again for your sweet gifts!!! That is such a great box! I love Jess and she is so creative!!! Loved being a part of this!! And LOVE those bows, of course! so cute!! i love all those goodies. and hello adorable bows!! such a festive little surprise! Oh my goodness, love your goods! The magnet craft is genius! Need to get that for Mia! This was the funnest exchange! That's a really sweet idea for a swap! Halloween was always such a magical time as a kid, I'm sure she's enjoying it :) I've never heard the term "Bopo" for a grandparent - was that something your kiddos made up?